Did you know that hemp seed oil has a ton of benefits as it is high in antioxidants and the essential fatty acids? (Aka the good kind, omega 3 and omega 6)! With National Brownie Day just around the corner on December 8th, add Uncle Bud’s Natural Hemp Products to your daily beauty roll up. 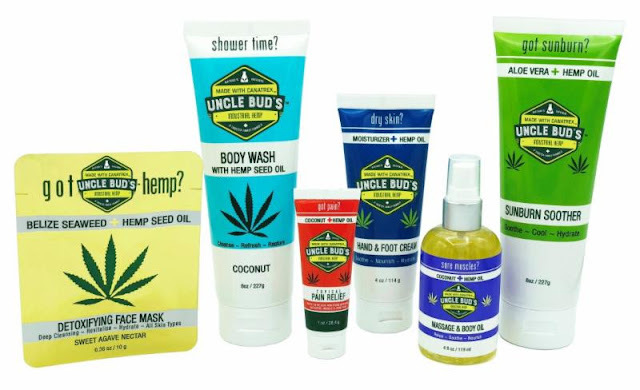 Every Uncle Bud’s product is formulated with the brands exclusive CANATREX technology, as well as with vitamin and antioxidant-rich hemp oil; a natural remedy that aids in muscle aches, joint pain, skin conditions, and much more. Uncle Bud’s Hemp Sunburn Soother ($15.99): Relieves discomfort from sunburn, insect bites, windburn and dry skin via a cooling, hydrating and healing blend of hemp oil and aloe vera.